Expectant mothers in Baltimore will soon be able to deliver their bundle-of-joy in a brand new, state-of-the-art facility. 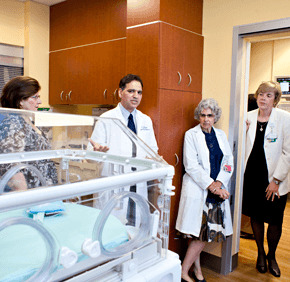 On May 10 Mercy Medical Center officials announced the June 10 opening of The Family Childbirth and Children’s Center in The Mary Catherine Bunting Center at the Baltimore hospital. The center will include a 13-bed labor and delivery unit – three of which are equipped with Jacuzzi-like tubs for water births – a 32-bed mother and baby unit and a newborn nursery, three antepartum rooms, three patient recovery rooms, two C-section surgery rooms, a 26-bed NICU and a five-bed pediatric unit. A major gift from Maryvale Preparatory School graduate and Baltimore philanthropist Mary Catherine Bunting in October 2007 was the cornerstone of a $400 million capital campaign and a 20-story tower in her name. The building opened in December 2010, seven months ahead of schedule, at a cost of $347 million – $24 million under projections. Coming in below budget allowed the hospital to “move aggressively” on the second phase of the project, said Thomas R. Mullen, president and chief executive officer of Mercy Medical Center. The project’s second phase includes the construction of the center for advanced fetal care and obstetrics and pediatric administrative offices on the second floor, totaling nearly 8,000 square feet; labor and delivery and the Neonatal Intensive Care Unit (NICU), spanning nearly 39,000 square feet on the eighth floor; and the mother and baby unit, newborn nursery and pediatrics, totaling more than 29,000 square feet on the 10th floor. Patient rooms, which include a bathroom, are divided into three zones – caregiver, patient and visitor – with sweeping city views. Three rooftop gardens, spanning 17,500 square feet, are on the eighth, ninth (surgery) and 10th floors. Dr. Robert Atlas, chair of obstetrics and gynecology at Mercy, said floors eight and 10 “really span that breadth” of new technology. Religious Sister of Mercy Helen Amos, executive chair of Mercy’s board of trustees, said the new facility allows for “hallmark service” of the Sisters of Mercy – healing love through clinical and residential services within a community of compassionate care. The projected cost for phase two is $41.5 million, Mullen said. Floors eight and 10 cost $27 million. Much like the December 2010 transition of nearly 200 patients in less than seven hours into the Mary Catherine Bunting Center, on June 10 patients will be transferred to The Family Childbirth and Children’s Center. The Bunting Center includes 259 private patient rooms and 15 state-of-the-art operating rooms.